White Chocolate Gingerbread Blondies: With just enough gingerbread flavor and a ton of white chocolate, these are the perfect addition to your cookie platters treats packages. Each year I find it increasingly difficult to narrow down the enormous list of holiday treats I add to all year long. And this year was no different. These white chocolate gingerbread blondies, however, have been near the top of my list for the past few years and they finally made the cut this year! It’s hard to put “pen to paper” about how much I love these blondies, with their subtle gingerbready-ness (just go with it), chewy texture, and white chocolate explosion. They are stellar little treats! Actually, Kyle and I both loved them so much that I needed to make a second batch because the first batch went so fast. Sigh. I did freeze most of that second batch so at least there were a few remaining for my cookie platters! 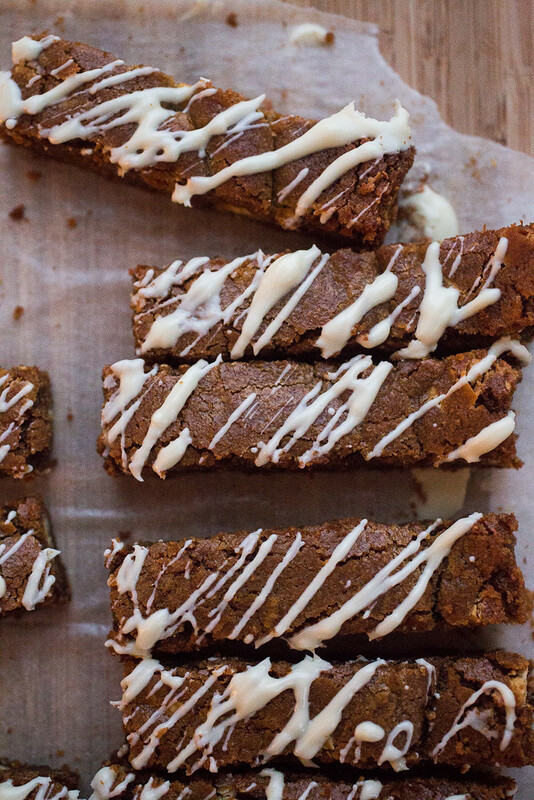 Drizzled with extra white chocolate, how could these white chocolate gingerbread blondies possibly be bad? Go on, make them now! These white chocolate gingerbread blondies have now become a staple in my holiday cookie platters every year since I first made them 4 years ago. People go absolutely NUTS for these gingerbread blondies!! And this continues to amaze me because I’ve always felt a little “meh” about gingerbread. Ha! I couldn’t keep these blondies in the house during that first Christmas season that they made their appearance in 2014. In fact, I think my parents were solely responsible for eating most of what I put out on my cookie platters! So I made extra during Christmastime 2015. Like twice as many as I made in 2014. Which means I made 4 batches of just these gingerbread blondies that year! Holy moly! That was A LOT of blondies! And that was in addition to rosemary butter cookies, pecan linzer cookies with raspberry filling, cranberry bliss bars, Lofthouse soft sugar cookies, thick and chewy chocolate chip cookies with Christmas M&Ms, and those insanely delicious and addictive peanut butter truffles. So I urge you to make extra. You’re going to need them! Make a double batch of these gingerbread blondies and freeze what you don’t need right away. Trust me, you’ll be incredibly proud of yourself for having made extra when you find out how incredibly delicious they are. To make the blondies: Preheat oven to 350° F. Line a 13×9-inch baking pan with parchment paper. In a medium bowl, whisk the flour, baking soda, salt, cinnamon, ginger, and cloves together; set aside. Beat the butter and sugars together in a large bowl until light and fluffy, 2-3 minutes. Beat in the eggs one at a time, scraping down the sides of the bowl as needed. Add the vanilla and molasses and quickly beat until incorporated. Stir in the dry ingredients with the mixer on low until they are just incorporated. Add the white chocolate to the bowl and stir very briefly until the chocolate is just mixed in. The dough will be thick, resembling a sticky cookie dough. Transfer the dough to the prepared pan, smoothing out the top with an offset spatula or lightly pressing the dough into the pan with damp hands (my preference). Bake for 33-35 minutes, until the center is set and a toothpick comes out clean when inserted into the middle of the blondies. Transfer the pan to a wire rack to cool completely before lifting the blondies out with the parchment paper and cut into long bars or squares. To make the white chocolate drizzle: Melt the coconut oil in a small saucepan over medium heat. Whisk in the white chocolate until completely melted and combined. Remove from the heat and drizzle the chocolate over the blondies. Chill for 1 hour or freeze for 20 minutes to allow the chocolate to set. Serve at room temperature. Store in an airtight container for up to 5 days at room temperature. Too funny! I’ll be sure to keep them on my Christmas baking list going forward.